Both writing and seatwork provide an absolutely essential foundation to your students’ education. In writing class, students learn cursive penmanship and then apply those skills to creative writing. Seatwork is written work students complete independently at their seats while another reading group is having Reading Circle. Seatwork helps them develop good work habits while reinforcing concepts learned in arithmetic, phonics, spelling, language, penmanship, and creative writing. The variety of seatwork activities holds their interest and builds their confidence as they practice new concepts. 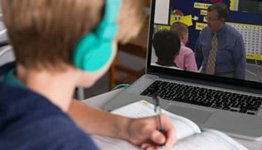 In turn, scanning seatwork papers (no grading required) will help you know in which areas your students are excelling and which areas need more emphasis. 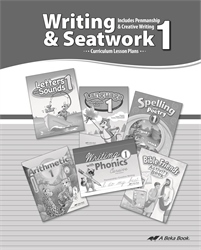 Use these lesson plans (already included in the Grade 1 Curriculum Teacher’s Guide) to find success in teaching both writing and seatwork! Ease of use. This easy-to-use volume includes bold headings, charts, numbered steps, diagrams and illustrations, and a contents page for each of the two sections. Find just what you need quickly. 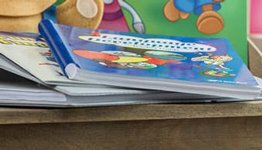 The spiral binding makes it easy to keep open just the page you want. Course overview. A “scope and sequence” chart for both subjects gives you a sequential overview of concepts covered in the 170 lessons. You can know where you are headed! 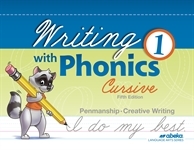 Sample graded penmanship tests: Unsure of how to grade your students’ penmanship tests? 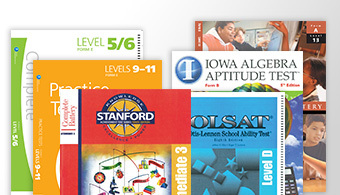 Samples of 18 graded tests with teacher comments show you how to do it! Suggested writing comments: It can be challenging to come up with fresh ways to motivate and encourage your students with their penmanship. Let our suggested writing comments page help! Biblical perspective. Whether it’s copying a Bible verse during seatwork or learning in writing class how George Washington Carver studied God’s design in plants, your first grade students view concepts from a biblical worldview with the Abeka curriculum.